Hoth Bricks somehow obtained a picture of the display stand for the Lego Series 13 minifigures. We can move a few more over to the confirmed side of the list for the new series that launches in January of 2015. Pictured right at the top is Sheriff of course. Then from left to right on the front side of the display stand, it looks like we have Unicorn Girl, Snake Charmer, Disco Diva, King, Paleontologist, Sheriff again, and Lady Cyclops. On the second display, from top to bottom, a large Sheriff, Egyptian Warrior, Alien Trooper, Unicorn Girl again and Disco Diva again. 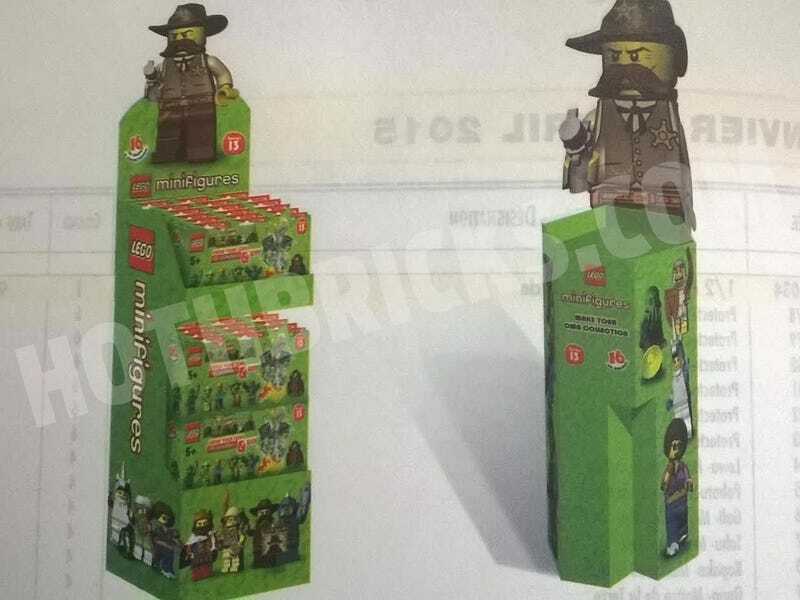 The front of the packaging is extremely hard to see, but there are at least 4 figs on there that aren't on the large displays. From left, looks like Disco Diva, Unknown, Paleontologist, Unknown,Sheriff, Unknown, whatever that big thing is and then another unknown. Discuss what you think those might be in the comments. Below is the alleged list from our previous post with the figs in this picture in bold.